Twitterの投稿Show posts in this category. Ecoleからのお知らせShow posts in this category. すく～るブログShow posts in this category. ヨーロッパ研修旅行Show posts in this category. 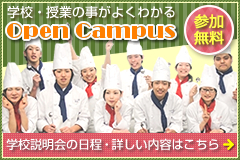 体験入学会リポートShow posts in this category. 在校生の声Show posts in this category. 学園祭Show posts in this category. 栄養士コースShow posts in this category. 製菓製パンコースShow posts in this category. 調理コースShow posts in this category. 選べる集中講座Show posts in this category. 高岡のひとりごと…Show posts in this category. Copyright © 2004 - Ecole DCPB. All rights reserved.